There have been a number of alarming stories about rabies in the news over the past couple of months. A lady in South Carolina was diagnosed with rabies in mid-December, the first in the state in 50 years. A Massachusetts man was the first in 75 years in the state to be diagnosed with rabies. You may have seen the story on TV of the dog that tested positive for rabies in Twinsburg, OH. 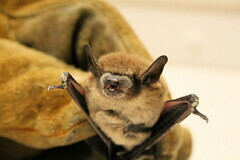 At first glance, this may not seem like a big deal, but on the heels of us learning that one of our clients was bitten by a rabid bat in the late summer, 2011, it is crystal clear that rabies is among us here in Summit County. The particular dog mentioned above had symptoms of a number of neurological viral infections, including rabies. She did not respond to supportive therapy, began showing more advanced neurological symptoms, and died within 36 hours of presentation. “The Centers for Disease and Prevention (CDC) confirmed that the dog was infected with a variant of rabies circulating among raccoons, the same strain of rabies associated with skunks in Lake County and raccoons from Ashtabula, Trumbull and Mahoning counties this year. This is the first known animal infected with the raccoon variant confirmed in Summit County, and the second dog confirmed with Rabies in Ohio since 1990. In addition to Rabies being a fatal disease that animals can pass to humans, the cost, inconvenience of quarantining, and stress of dealing with the unknown is not something that anyone wants to endure. And it’s all so preventable! Not only is keeping our pets current on their rabies vaccine status a county law, it is good for peace of mind. It should also be said that no wild animal should ever be handled, particularly if the animal is showing even subtle abnormal behavior. For instance, if a raccoon or a coyote is wandering in the street or in a yard in broad daylight, one thought should immediately come to mind: “This is not right!” Rabies is too dangerous of a disease to be taken lightly. If you have additional questions about rabies and the risk to your pet, don’t hesitate to give us a call at 330-929-3223, or contact the Summit County Health Department. Comment on "Rabies: it is here, and it is preventable"